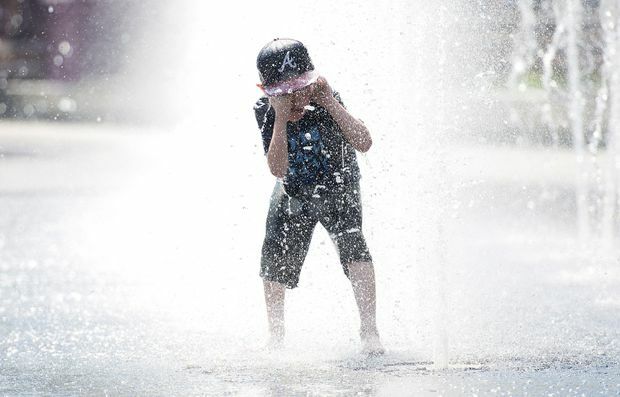 Seven-year-old Samuel Bedard from Quebec City runs through a water fountain as he beats the heat in Montreal, on July 2, 2018. A Quebec group is taking the groundbreaking step of bringing climate action into the courts by launching a legal battle against Ottawa for violating the rights of young people by failing to tackle climate change. The environmental group is initiating a lawsuit on behalf of nearly 3.5 million Quebeckers at or below the age of 35 – the cohort that, it argues, faces the most dire consequences of global warming. “It’s our generation – the children of today and future generations – who will feel the full force of climate change,” said Catherine Gauthier, executive director of the group and the representative plaintiff in the case. Environnement Jeunesse filed a motion for authorization of a class-action suit against Ottawa in Quebec Superior Court on Monday. In doing so, the non-profit joins a global movement seeking to combat climate change through legal channels and hold governments accountable for environmental damage. Other countries are seeing similar challenges. In the United States, 21 child and teenage plaintiffs have asked the courts to force their government to act against global warming, claiming their fundamental constitutional rights are being violated. Last month, a court in The Hague upheld a landmark ruling ordering the Dutch government to cut the country’s greenhouse gas emissions after a foundation took the government to court on behalf of nearly 900 citizens in Holland. The Quebec group wants to use both the federal and Quebec charters to argue that climate change violates young people’s rights. The Quebec charter offers an additional legal weapon: It says every person has a right to live in a “healthful environment” that preserves biodiversity. “Despite recognizing the urgency of acting and the grave dangers posed by climate change, the Canadian government did practically nothing,” the court document says. The group argues that Ottawa’s targets for reducing greenhouse gases fail to stop climate change. Montreal lawyer Bruce Johnston, who is representing the group pro bono, said Ottawa doesn’t even have a plan allowing it to reach its already “grossly inadequate” targets. “The government has acted in full knowledge [this] will lead to a catastrophe,” Mr. Johnston said in an interview. The suit targets Ottawa because the federal government can set climate goals and has the constitutional powers to enforce them, he said. The office of Federal Environment Minister Catherine McKenna is aware of the lawsuit but wouldn’t comment on it because it hasn’t seen the legal documents. “We have a serious plan to protect the environment and grow the economy,” said Caroline Thériault, Ms. McKenna’s director of communications. A U.S. report released last Friday warned that climate change would damage everything from human health to infrastructure and agricultural production, as global temperatures threaten to surge beyond internationally agreed limits. The Quebec suit seeks $100 a person in damages on behalf of nearly 3.5 million young people. But the group says its main goal is to obtain a court ruling that would hold the federal government accountable for any future course of action on climate change.